Some festivals are driven by the tastes of fans, other by the designs of the music industry. New Orleans’ Ponderosa Stomp is unique in being driven by the history of American popular music itself. The Stomp is a festival with a mission: to preserve, promote, and celebrate American roots music in all its forms, including classic country, blues, rockabilly, old school rock and roll, R&B, Cajun, Zydeco, Swamp, and more. In the nine years since its establishment, the Ponderosa Stomp has emerged as America’s premier roots music festival and developed into a living, jamming archives of American popular music – with, perhaps, a special passion for the music of its native Louisiana. Ponderosa Stomp artists are drawn from veterans and significant figures in every roots genre. Some, like two time Grammy-winning Delta bluesman Honeyboy Edwards, are true musical superstars. Others, like Duane Eddy, will be familiar to most music fans (with songs like “Rebel Rouser” and “The Peter Gunn Theme,” that are almost universally recognized). Some names, like Jay Chevalier or Huelyn Duvall, are well known to roots cognoscenti. A few Ponderosa Stomp artists, however, are truly musical coelacanths – once noteworthy artists who somehow faded into obscurity or made contributions to American popular music for which they never received proper credit. For these artists, Ponderosa Stomp is a venue that finally gives them their place in the Sun. 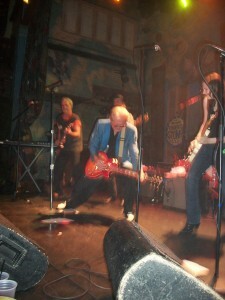 The 2010 Ponderosa Stomp was held at New Orleans’ legendary House of Blues, located in the heart of the French Quarter, just a stone’s through from the mighty Mississippi River that has nurtured so many of America’s roots genres. With bands performing on the main stage as well as on the patio at the rear of venue, the 2010 Stomp showcased 40 artists over the course of two nights of music. This year’s event featured all the traditional Stomp genres, with a special focus on swamp pop – a fusion of country, Cajun, rockabilly, and rock and roll that flourished in Louisiana and East Texas in the late 40s, 50s, and 60s. As with any festival boasting multiple stages, choices (sometimes painful ones) about who to see and who not to see must be made. I have endeavored, to the best of my ability, to cover those acts that will be of greatest interests to the readership of this site. The 2010 Ponderosa Stomp kicks off with an ensemble on the main-stage consisting of Doug Ardoin and Bert Miller, backed by New Orleans rockabilly/hillbilly outfit Michael Hurtt and the Haunted Hearts. Ardoin and Miller are two of the founding members of The Boogie Kings. Created in 1959, the Boogie Kings were one of the first bands to be dubbed, “blue eyed soul.” By 2010, however, that term has moved so far from its original connotations that, in the modern musical lexicon, it is far more informative to call them an R&B outfit. Ardoin was the Kings’ original guitarist while Miller served as drummer and lead vocalist. Bert Miller, drummer and singer. The ensemble opens their set in an appropriate fashion, with a cover of the classic New Orleans blues tune, “St. James Infirmary.” In the 1950s, the Kings gained a reputation as one of the first white bands that not only played the blues, but played it well. As their rendition of “St. James” shows, 50 years later, they’ve still got it. They begin with a solid boogie line on the piano and smoking, sax-driven melody – all delivered with a strong back-beat on drums. In spite of the high energy instrumentation, the ensemble preserved the mournful, almost dirge-like character inherent to the song. Miller is an impressive and memorable vocalist, with a distinctive, sonorous, twangy voice that invokes a slightly dialed-back Willie Nelson singing blues and R&B. After a music career spanning five decades, Miller still packs a lot of power in those pipes. He remains an enjoyable performer to watch, strutting about on stage and gesturing wildly to the audience. The Boogie Kings follow their first number with “Please Forgive Me If I Cry,” delivered in a classic Louisiana rock fashion – and with more than a hint of Fats Domino in their sound. The rock format showcases Ardoin’s formidable skills on guitar, trading commanding lead lines back and forth with the sax player. Yes, when she spread her wings around me,/I get joy in most everything. Again, Ardoin is front and center, pumping out blues riffs with panache and a perfect sound that would be the envy of any Delta musician. The Kings closes their set with, “Let the Good Times Roll,” Another up tempo number that weaves together many different threads of Louisiana music. Miller’s vocals again shine as he throws a little B.B. King-esque power and baritone into his words. A musical prodigy, by the age of 15 Allan was playing in the band of Cajun music legend Lawrence Walker. When Allan started dabbling in rock and roll, Walker told Allan he had to make a choice – and, in 1958, Allan left Walker’s band to form the Krazy Kats, one of the first great swamp pop bands. Taking the stage in a stylish black vest and while button-down shirt and donning a pair of slightly tinted eyeglass, the “Singing Principal” still very much looks the part of a veteran Southern roots rocker. He still moves like one, too, with a high energy stage performance that fired up the Ponderosa Stomp crowd. His set is dominated by Allan classics like “Promise Land,” “See What You Did to Me,” and “Let’s Do It.” Allan sings in smooth yet powerful, velvety Louisiana tones that hint at his earlier years in Cajun music. Musically, his numbers segue from pure swamp pop to Louisiana rock ballads to old school rock in the Sun Records mold. Backing Allan, Michael Hurtt and the Haunted Hearts shinned, with a rollicking honky tonk piano, powerful sax solos, and epic tenor/baritone sax duets. An accordion, added for one song, underscored the distinct Louisiana strains of Allan’s music. Thematically, his songs, even up tempo ones, tend towards soulful, pining ballads of love lost, proclamations of devotion, and stories of young love’s first bloom. In 1958, if you were 15 years old and living in South Louisiana, this is the music you would have played on a date in hopes of getting to first base. Even with such a classic set, several numbers stand out. Opening with a honky-tonk worthy rendition of 1963’s “Let’s Do It,” Allan moves on to “Lonely Days, Lonely Nights.” The latter was a tight performance but is, perhaps, most interesting for its historical significance. “Lonely Days, Lonely Nights” represents Allan’s closest brush with national fame. It was originally released on the Louisiana’s small but celebrated JIN label in 1958 and sold an impressive 50,000 copies regionally. It was rerecorded and picked up nationally by MGM Records in 1959 where, as Allan, jokes it sold “about 1,500 copies.” MGM dropped Allan, who was soon back on the JIN label. “Promise Land,” an irresistible, swamped-up version of the Chuck Berry hit, was performed by Allan with incredible energy. “Cry My Heart Out For You” took Allan’s mastery of bittersweet love ballads and velvety voice to levels worthy of 1950s teen idol music. One of the most impressive things about Allan’s set at the Ponderosa Stomp is that started strong … and got stronger. His first numbers, which were impressive, seemed to have only been a warm up. The latter half of his set featured some very fancy footwork during performances as his voice progressively seemed to fill and more and more of a very large performance space. Watching him in 2010, it is hard to not imagine him doing it just that way 50 years ago. After the Johnnie Allan set, I moved outside to the patio stage for a showcase of short sets by noteworthy Cajun musicians Harry Anselmi, Leroy Martin, Vin Bruce, and DL Menard – all backed by The Lost Bayou Ramblers, a popular contemporary Cajun/roots band out of Lafayette, Louisiana, the “capital” of Cajun Country. Taking the stage in a fashionable black cowboy hat, striped shirt, and tight-trimmed goatee, Anselmi looked more contemporary than many of his other Ponderosa Stomp colleagues. He begins his set it an unorthodox fashion — by questioning whether he made the right choice by getting into music. Playing gigs most every day and often being on the road, he expresses regret that he never got to take his daughter to the park or to play ball with his son. But, however, he says he does not regret all the charity work he could do through his music. The first song is a fast-paced number, oozing with Cajun sound and flavor. Together, Anselmi and the Lost Bayou Ramblers create a whirlwind of roots energy: peddle steel playing half-way between Cajun and country, old school rock and roll slap bass, pure Cajun fiddle, and Anselmi’s delightful Cajun tones all blending together beautifully. Like many classic Cajun musicians, Anselmi sings in both English and Cajun French, easily and smoothly (perhaps even subconsciously) switching between one and the other. His second tune is “Louisiana is my Home.” It is pining song of heartache and separation – a love song by any definition, but with Louisiana itself as the object of Anselmi’s affection. Musically, it is a slow, mournful ballad with plenty of twang – both on vocals and on strings. The next song showcases Anselmi’s skill as a lap steel player. Well complimented by some frenetic fiddle playing by the Lost Bayou Rambler’s Louis Michot, Anselmi belts out rich and soulful tunes on his steel — occasionally evening giving it a bit of slide sound. 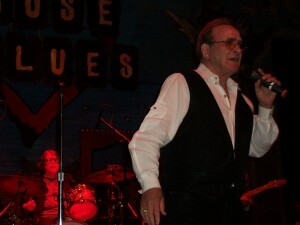 Martin approaches the microphone looking like a South Louisiana version of the man in black: black vest, black shirt, and black pants – all accenting with a shining, golden bolo tie. As he took the microphone and begun singing he revealed a voice of considerable strength. If, perhaps, it is not as hauntingly pure a Cajun or swamp pop voice as some of the other Ponderosa Stomp artists, it has an undeniable passion. Supported by Harry Anselmi, still playing lap steel, and the Lost Bayou Ramblers, Martin energizes more than a few people in the audience into dancing. Martin plays only one song as part of the Stomp’s Cajun set. He is better known for his swamp pop than his Cajun and has a second, much longer set during a swamp pop showcase later in the evening. 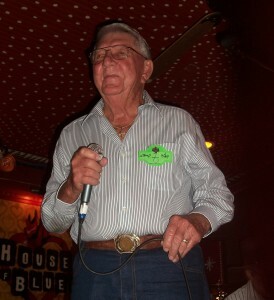 Vin Bruce is a true hero of Cajun music. The son of a highly regarded local fiddle player, at the age of 17 Bruce was sought out by iconic A&R man and record producer Don Law and signed to Columbia records – making the young Bruce one of the first Cajun artists to be signed to a national label. Bruce was also one of the first Cajun artists to find widespread acceptance in Nashville, recording with artists such as Chet Atkins, Grady Martin and Tommy Jackson. Bruce cut his first record in 1951 and actively recorded and toured until the 1980s. He has remained an important ambassador for Cajun music, touring widely in North America and Europe. Casually attired, with only a massive metal belt buckle to suggest down home origins, Bruce brings his rich, full Cajun voice to the stage — sans the rock and country vocal influences of many of his other Cajun colleagues. Bruce is the real deal and treated the audience to flawless renditions of his Cajun classics. Unfortunately, I had to return to the main stage before the end of his set in order to cover an equally epic and storied artist. Huelyn Duvall is one of the gems of early Texas rockabilly – almost everyone has heard his voice, even if they don’t know it. The widely known 1958 Champs release “Tequila” contains exactly three words, the name of the eponymous drink are repeated exactly three times throughout the song – and it is Duvall’s distinct voice intoning those words (he was 19 years old at the time). Born in 1939, Duvall has been picking since receiving his first guitar at the age of 14 and he is credited with being one of the first of artists to introduce the rock sound to East Texas. After a strong start to his career, Duvall largely stopped playing music in the early sixties. But, after a twenty year hiatus, he was rediscovered by the rockabilly revival of the 1980s and has been gracing stages ever sense. Taking the main stage at the Ponderosa Stomp, with a cherry red guitar in hand, wearing a blue blazer, and sporting a crest of silvery hair, every inch of Duvall looks like the rockabilly revivalist he is. His set led off with “Three Months to Kill,” an anthem of summertime youth very much in the vein of Eddie Cochran’s “Summertime Blues.” The song, however, has had more profound impact on music than its slightly derivative quality might suggest – in a 1988 interview Jimmy Page and Robert Plant credited Duvall, and specifically “Three Months to Kill,” as one source of inspiration for the Led Zeppelin sound. No matter how brief, his vocals on “Tequila” are good preview of Duvall’s sound. He possess a great voice – deep, dark, powerful, even wild. In addition to memorable vocals, “Three Months to Kill” is also driven by some great guitar work, both from Duvall and from the supporting band, Eve and the Exiles – a guitar rock and roots rock powerhouse out of Austin. “Feel Like Rockin’” is a song that epitomizes rockabilly in all its energetic, up tempo, twangy backbeat glory. “Boom Boom Baby” is another rockabilly number that hooks listeners with a catchy baritone chorus (“Boom-boom, boom-boom, boom-do-wah”). The tune was a hit in Australia, but made relatively few waves in the US. 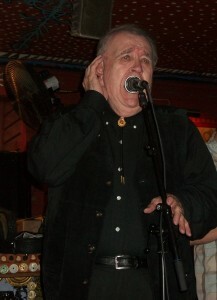 Duvall’s singing on “Boom Boom Baby” is in a fashion that has more in common with early Elvis than with much of his other vocal work. “Get Carried Away” is an archetypical 1950s rock and roll love song set to great rockabilly instrumentation. It is not as energetic as many of Duvall’s songs but is still compelling – beautifully voiced and full of lyrical imagery about dating and courtship in the 1950s south. “So Help Me Gal” featured a great guitar rock intro supplied by Duvall and Eve and the Exiles. After Huelyn Duvall’s set, I rushed back out on the patio in hopes of catching the final act of the Cajun showcase, DL Menard. I was fortunate, and managed to catch Menard’s last two songs. Dubbed “The Cajun Hank Williams,” Menard shares William’s long, lanky frame and striking, angular features. However, the epithet stems more from artistry than appearance – Menard’s voice is possessed of a sharp, tinny drawl that, likes Williams’, seems to waft directly from a distant pre-rock era of Americana. Born in 1932 and raised in a tiny south Louisiana farming community, Menard spent his early years working in the cotton fields. He began playing music professionally in 1949 and soon began writing his own songs, music that celebrates Louisiana’s Cajuns, their lifestyle, and their language. 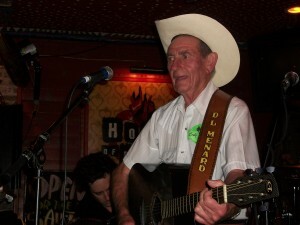 In the six decades Menard has been playing music, he has remained an influential and highly respected Cajun musician. The pinnacle of this recognition came in 1993 when, as part of Le Trio Cadien, Menard shared a Grammy nomination for best traditional album. In 2010, Menard’s voice has lost none of its ability to move. It is a voice distinctively at odds with the aesthetic sensibilities of modern Los Angeles, Nashville, and perhaps even Lafayette. But it is a soulful, bewitching voice, full of passion and that seems to wear its metaphorical heart on its sleeve. Menard is also a respectable guitar player, his old-school county and Cajun strumming building a solid foundation for his vocals. After the Cajun showcase, music on the patio detoured into another sphere of American roots music with Honeyboy Edwards –- who is not only a superstar of Delta Blues but also a living link to the early decades of a genre that has profoundly impacted all other forms of American popular music. Edwards was born in 1915 in Shaw, Mississippi, located in the heart of Delta Region. 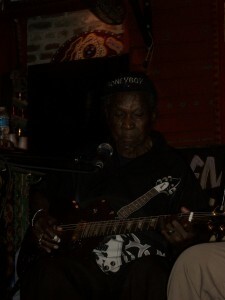 Edwards, along with his friend Pinetop Perkins, is one of the last surviving figures of the second generation of Delta Bluesmen. Perkins knew Robert Johnson back before he could play like hell (perhaps literally) and was likely one of the last people to see that most legendary of bluesmen alive. Although he recorded only 15 sides in the heyday of Delta Blues, a far smaller discography than many of his contemporaries, he has fared well since the blues revival of the 1960s. Edwards is now a double Grammy winner, sharing the 2008 Best Traditional Blues Album for Last of the Great Mississippi Delta Bluesmen and receiving the Lifetime Achievement Award in 2010. At the age of 95, Edwards looks and sounds like what everyone expects a venerable Delta bluesman to be. And he plays the part magnificently. With his wizened and weathered face, wild mop of gray hair atop his head, and deep, inscrutable eyes, he is a striking figure. Looking into his eyes, it is impossible not to feel the immense power of time and history behind them and to find yourself wondering about the things those eyes have seen. Taking his seat on stage, he was clad in all black, save his for brown leather shoes and a baseball cap reading simply “Honeyboy.” He opened his set with a slow, steady Delta Blues guitar line – every note perfect in tone and time. As he begun singing, he revealed a voice that is soft and supple, yet surprisingly powerful. His tones are full of bluesy gravel and even growl. Edwards’ set was exactly what the audience expected and wanted, a litany of classic Delta Blues tunes like “Goin’ Down Slow,” “Catfish Blues,” “Heard My Mama Tell My Papa,” and “Hey Baby, Won’t You Ride With Me.” “Catfish Blues” is a song closely associated with Edwards. “Hey Baby, Won’t You Ride With Me,” as the title suggests, is part of a long Delta Blues lyrical tradition of using automobile imagery for sexual innuendo. At the age of 95, his guitar work is still robust, occasionally vigorous – he still throws his entire body into key notes and chords. Edwards is a relaxed but deeply focused performer. Most of the time, his eyes look downward, focusing upon the guitar and his hands moving masterfully across it. Occasionally, he raises his head and gives a good natured, almost shy, smile to the audience before again lowering his gaze. Edwards is a master musician in a challenging genre. But, even beyond his musical prowess, watching him play, it is difficult not to be in awe of looking at and listening to a living link to the origins of American popular music. In that, he is a living, breathing symbol of the Ponderosa Stomp itself. Music on the patio at the first night of The Ponderosa Stomp concluded with performances by artists who have been influential in Louisiana swamp pop and rockabilly, including Leroy Martin and Jay Chevalier. Martin, who made a brief appearance during the Cajun showcase earlier in the evening, returns to the stage to perform several of his non-Cajun pieces. Before beginning, he shares a bit of his background with the crowd. In addition to talking about his work as a tax assessor and record producer for some of Louisiana’s most famous studios, he mentions that he was born in 1929, joking that, “I don’t know if I caused the Depression or if the Depression caused me.” As musician, however, Martin is anything but depressing. His first song is “Born to be a Loser,” an old Jimmy Donley number. It is a good old fashioned, down-tempo heartbreak song in a minor key. His voice displays more poise than during his Cajun set — a distinct and powerful baritone with just a hint of lilting, rolling Fats Domino to it. Those hints are emphasized by a strong if slow boogie piano line. The second song is a surprise – but a delightful one. Martin turned up the energy and intensity a notch and really packed a punch into the number. It is the kind of sax-driven roots rock piece that makes it almost impossible to keep one’s feet still (and, with much of crowd happily swaying in time to the music, the Ponderosa Stomp audience seems to agree). His next song was “Cheating Traces.” It is a slower number, offering an amusing if less-than politically correct checklist about how to cheat on one’s partner – and get away with it. “Cheating Traces” triggers a story from Martin about a moment of life on the road back in the earliest days of swamp pop. Martin and his band were playing a gig at club in rural Louisiana. Taking a break to go the restroom, Martin was approached by a man from the audience. “I’m really enjoying your show tonight, Leroy,” he began, “and I just wanted to let you know that you didn’t see me here. And you didn’t see the lady I was with, either.” After that, he pressed a $20 bill into Martin’s palm (to put that in perspective, the band was getting paid $15 per member for the gig). The irony was that, to this day, Martin has no idea who the man was – or the lady he was with. He concludes his with “When I lost you,” another bittersweet swamp love ballad. In addition to being classic roots music sung “in the key of heartbreak,” Martin’s music is interesting for another reason. It highlights the close connection between old school Louisiana rock and the blues. Many of the songs in Martin’s set use the same AAB lyrical conventions of Delta blues, to say nothing of drawing upon similar themes, imagery, and even stock phrases. One of the great heroes of Louisiana rockabilly, in a musical career spanning more than half a century Jay Chevalier has earned a special place in the hearts of Louisianans. In 2006, the state legislature declared Chevalier, “The Official Troubadour of the State of Louisiana.” It is difficult to argue with that designation, especially when so much of his extensive discography is comprised of affectionate songs about Louisiana – clever, visually rich songs with an eye for historical and cultural detail. Chevalier was born in 1936, in a poor, rural section of central Louisiana. He formed his first band while serving in the Marine Corps. The band rapidly found success, appearing on Country Singer Jimmy Dean’s TV show just a few years later. His second number is another selection from Chevalier’s Louisiana oeuvre. “Billy Cannon” is a high-energy rockabilly ballad celebrating the legendary Louisiana State University football player of the same name. When “Billy Cannon” first came out, it sold over 100,000 copies throughout the state, a phenomenal total for the time – and turned Chevalier into an instant superstar of Louisiana music. In addition to irresistible vocals, Chevalier supplied his own very credible guitar lines on an amplified-acoustic. The real instrumental star of the number, however, was New Orleans keyboardist Armand St. Martin. An iconic roots musician in his own right, St. Martin delivered what was, quite frankly, one of the most impressive and technically intricate rockabilly piano solos this reviewer has ever witnessed – his hands moving so fast they dissolved into a translucent pink blur covering the keyboard. Chevalier’s third song was, “Too Many Bubbles (and Too Much Beer).” Unlike most of his songs, “Too Many Bubbles” leans more heavily on golden age country music than rockabilly. Perhaps Chevalier concluded that only country music can really deliver on an up tempo and surprisingly upbeat song about drinking one’s life’s ambitions away. 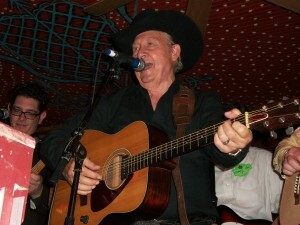 The next song explodes into a honky tonk, Hank William’s style “leavin’” song with a Louisiana twist to the lyrics (“You can keep your dirty rice and crawfish stew”). Chevalier’s memorable vocals on the piece were driven forward by phenomenal instrumentation, especially on guitar and piano. Another paean to the Pelican State follows. “The Ballad of Earl K. Long.” celebrates the colorful and eccentric but highly popular former governor (and brother of Huey P. Long). Its lyrics are choc-full of powerful imagery from Louisiana history. Along with “Billy Cannon” it was “The Ballad of Earl K .Long” that helped cement Louisiana’s love affair with Chevalier. On the sixth song of his set, Chevalier changes the pace and dials it back a notch with his rendition the country standard “I Heard You Calling My Name.” The slow, heartrending lament of a left lover is in stark contrast to the staccato energy of his rockabilly work. The twang of Chevalier’s voice, however, proves just as capable of haunting as hell raising – and the number is a beautiful one. From there, Chevalier returns to the Louisiana theme. His 1959 release, “Lost in Louisiana,” is a country love song with a twist. In some ways it is typical of the genre, a lot sappy and a little sad. But the love interest here isn’t flesh and blood – rather, it is the state itself. The number may also be at least semiautobiographical, talking about Chevalier’s own love affair with Louisiana and why, perhaps, he never achieved the same recognition nationally that he found so easily within his native state. Its lyrics are full of references to other local and national artists of the day as well as major then-contemporary figures in Louisiana like such as Blaze Starr and, again, Earl K. Long. The ninth song was easily the most memorable of his set. 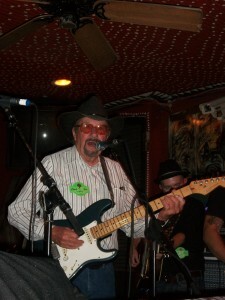 Chevalier was joined on stage by veteran swamp blues harmonica player Lazy Lester for a rendition of the Hank Williams, Sr. classic “Your Cheating Heart.” As the performance unfolded, Lester’s impassioned Louisiana blues harp proved the perfect compliment to Chevalier’s twangy, sonorous and mournful vocals. Ponderosa Stomp audiences tend to be fans of multiple genres of roots music and, therefore, enthusiastic about cross-over performances. One as well executed as the Chevalier-Lazy Lester duet was more than sufficient to send the audience into an approving frenzy. “Your Cheating Heart,” was followed by another Hank, Sr. song, “Jambalaya,” a celebration of all things Cajun. Unlike the moderate tempo and more restrained vocals of the Hank Williams version, Chevalier’s take on the song is more, well, Cajun. His vocals are rabid and joyous, backed by wave after wave of energetic fiddle and peddle steel as well as more breathtaking keyboard playing by Armand St. Martin. Chevalier concluded his set with the 1960 “Castro Rock,” an improbable yet musically irresistible rockabilly critique of the Castro regime that is full of tongue-in-cheek yet bitingly sarcastic lyrics. “Castro Rock” was initially released to a whimper rather than a bang, in large part because its overtly political theme made radio stations uncomfortable. Beginning in the 1970s, however, the song experienced something of a revival as a critical and cult favorite. (Nor was this Chevalier’s only foray into international relations, 1962’s “Khrushchev and the Devil” was similarly panned by radio stations of the day. Some station managers apparently believed the song might even precipitate an international crisis). Of course, almost 50 years later, Castro is still around. But so is Jay Chevalier. And he looks like he’s having a hell of a lot more fun. Chevalier is a phenomenal musician. But he is only one man. A lot of the credit for recreating the vivid, diamond-in-the-rough sound of the rockabilly music of five decades ago belongs to his supporting musicians, including the formidable keyboardist St. Martin and, again, Michael Hurtt and the Haunted Hearts. As the last chords of Jay Chevalier’s guitar quit reverberating around the patio stage, my first day at the Ponderosa Stomp comes to an end. I feel almost overwhelmed by sheer volume of excellent and historically significant music I have seen over the course of the evening. I have also learned two valuable lessons. First, there are still many areas of American roots music about which I have a great deal to learn. Second, even when temperatures are moderate, the New Orleans humidity is brutal – the long sleeve shirt was definitely a bad call. I shall return tomorrow evening with fresh ears … and fresh shirt.